Riders Jake Johnson, Brandon Robinson and Kenny Coolbeth Jr. each advanced through semi-final heats, with Johnson earning a front-row starting position with the fifth-best qualifying performance. 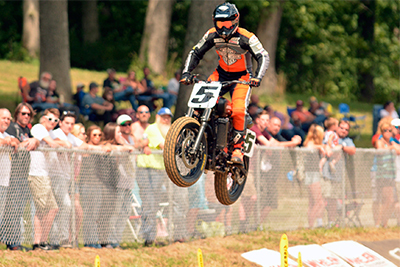 The Peoria TT is a classic event in American flat-track racing. Held each year since 1947, the race is a true TT with left- and right-hand turns and jumps over a 0.6-mile course. For the first time in more than two decades, this year’s edition of the Peoria TT was contested on twin-cylinder motorcycles like the Harley XG750R rather than single-cylinder bikes. The course was also changed to include a pair of jumps rather than the traditional, single jump. In the 25-lap main, Johnson, who finishing third at the Buffalo Chip TT in Sturgis, SD, on August 6, got a good start and was racing with the lead pack but was forced to retire from the race on lap three with a mechanical problem. Robinson started in 10th position and finished 11th. Coolbeth started 18th and finished 16th. After 14 of 18 races on the 2017 AFT Twins schedule, Robinson is in seventh place with 106 points. Coolbeth is in 12th place with 78 points, and Johnson is 13th with 71 points. Harley-Davidson® Factory Flat Track Racing Team will be back in action on September 3 for the Harley-Davidson Springfield Mile at the historic Illinois State Fairgrounds track in Springfield, Ill.